In last year’s roadmap, I forecast that 2017 would end with gold prices up and the dollar index down, both of which happened. I underestimated the number of Fed hikes by one hike, but globally, average short term rates have remained around zero. That will be a core pattern throughout 2018. Central banks may tweak a few rates here and there, announce some tapering due to “economic growth”, or deflect attention to fiscal policy, but the entire financial and capital markets system rests on the strategies, co-dependencies and cheap money policies of central banks. The bond markets will feel the heat of any tightening shift or fears of one, while the stock market will continue to rush ahead on the reality of cheap money supply until debt problems tug at the equity markets and take them down. Central bankers are well aware of this. They have no exit plan for their decade of collusion. But a weak hope that it’ll all work out. They have no dedicated agenda to remove themselves from their money supplier role, nor any desire to do so. Truth be told, they couldn’t map out an exit route from cheap money even if they wanted to. The total books of global central banks (that hold the spoils of QE) have ballooned by $2 Trillion in assets (read: debt) over 2017. That brings the amount of global central banks holdings to more than $21.7 trillion in assets. And growing. Teasers about tapering have been released into the atmosphere, but numbers don’t lie. That’s a hefty cushion for international speculation. Every bond a central bank buys or holds, gets a price-lift. Trillions of dollars of such buys have artificially lifted all bond prices, and stocks because of the secondary-lift effect and rapacious search for self-perpetuating returns. Financial bubbles pervade the world. Central bank leaders may wax hawkish –manifested in strong words but tepid actions. Yet, overall, policies will remain consistent with those of the past decade to combat this looming crisis. US nationalistic trade policies will push other nations to embrace agreements with each other that exclude the US and shun the US dollar. And finally! My new book Collusion: How Central Bankers Rigged the World comes out on May 1. 2018. You can see my book tour schedule evolve over the next few months on my website. I look forward to seeing you at the upcoming events. The Fed predicted three hikes for 2017, and for the first time in three years of announcing rate increases, met its own forecast. Thus, Federal Funds Rates rose by 75 basis points. In Europe, the European Central Bank (ECB) kept rates in the zero percent range. Gearing up to Brexit, the Bank of England raised rates by a mere 25 basis points. In Japan, the Bank of Japan (BOJ) kept rates negative. The People’s Bank of China (PBoC) didn’t alter its benchmark rate this year, though it did increase its medium-term lending facility and its open market reverse repo agreements by a whopping 15 basis points in 2017. Those aren’t exactly definitive tightening bias moves. The ECB announced a “tapering” bias, but in practice, merely cut its monthly purchasing pledge while extending the total period of purchasing. This was a typical central bank ‘bait-and-switch’ maneuver, the net effect of which will be more QE, not less. Japanese Prime Minister Shinzo Abe’s snap election victory last fall secured BOJ head, Haruhiko Kuroda in his spot, or at least, provided a green light for more easy money provisions to the Japanese capital markets. In the US, Jerome Powell will assume the helm at of the Fed on February 4. How different will his policies be from those of Janet Yellen or Ben Bernanke? Not much. He voted in favor of the Fed’s monetary easing programs (even with hesitation) every time. Powell will embrace the same unlimited easy money policy on any sign of market weakness, as the global web of central banks remains as omnipresent as ever. Global stock markets, being the easiest place to park cheap money will rise at first in 2018. 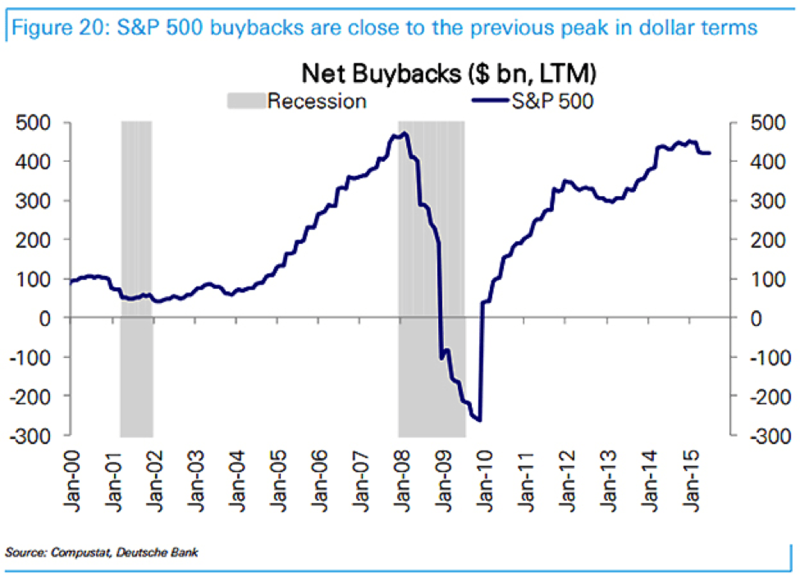 This will take place on the back of another spurt of record corporate buybacks. The move will carry on due to a self-fulfilling prophesy of return-seekers (from hedge to pension funds) until met by a span of corporate or bank scandals or geo-political risk. In the US, the Dow Jones finished the year up 28.11% adjusted for dividends (compared to 16.47% adjusted for dividends in 2016.) President Trump took credit for the equity euphoria, as Obama and other presidents have done in the past. The reality is that stock markets were bolstered by historically cheap money and more than $14 trillion of QE. If the Fed (or any major central bank) was to unwind the $4.5 trillion of assets it’s holding, markets would plummet. That’s why the Fed isn’t moving much, nor are other central banks, to truly reduce the size of their artificial market intervention. But when markets fall back to earth – the drop will be quick and painful. On the flipside, there’s economic reality. Job growth is at its slowest pace since 2011, wage growth is relatively stagnant and job market participation sits at four-decade lows. While the stock market continues to shatter records, the real economy remains left behind. Debt is at epic levels any way you slice it, public debt, corporate debt, credit card debt, student loan debt. There will be a tipping point – when money coming in to furnish that debt, or available to borrow, simply won’t cover the interest payments. Then debt bubbles will pop, beginning with higher yielding bonds. Leverage is a patient enemy. Fueled by low rates and a strong investor appetite, debt of nonfinancial companies in the US has accelerated rapidly, to $8.7 trillion, a figure equivalent to more than 45 percent of GDP. Nonfinancial corporate debt outstanding grew by $1 trillion over the past two years. US tax cuts will propel more issuance at first, due to the perception of more money available later with which to repay it. That is not the same as actual profits. This is the year where borrowing fueled by central banks slams into a wall of growing defaults. Expect corporate defaults to rise on the back of even slight rate hikes. Defaults will deepen in non-Asian emerging markets first. That’s because those currencies haven’t done as well against the US dollar as in other countries, and central banks and governments aren’t as able to sustain that debt through various intervention maneuvers. Meanwhile, major central banks will find ways to fuel corporate bond markets to stave that crisis off as long as they can. The ECB’s corporate buying program kicked into high gear in 2017, for instance, driving corporate spreads and rates downward. The ECB’s corporate sector purchasing program (CSPP) will expand the ECB’s corporate bond holdings to over 20 percent of its whole book, double today’s percentage. Other central banks will try to do the same, but face headwinds. China has a $3.4 trillion corporate bond market showing signs of struggle. With more than $1 trillion of local bonds maturing in 2018-19, it will become increasingly expensive for Chinese companies to roll over financing, which is why the PBoC will maintain its QE programs in 2018. The dollar index that tracks the dollar against other major currencies (including the Euro and the Pound sterling) hit 14-year lows in 2017. As the index dropped accelerated, it exhibited a counter-historical diversion from the behavior of the US stock market. That pattern looks set to continue in 2018, despite any minor US rate increases that did not serve to bolster the dollar against other major country currencies last year. It’s also counter-intuitive for the currency coupled with rising rates to underperform the one with easier policy. Yet, that’s what happened between the US dollar and the Euro in 2017. The Euro’s surge will carry on given that its strength better reflects surrounding economic reality, than the dollar does for the US, where the stock market has far outpaced economic factors like wages and job force participation levels. Similarly, gold and silver will rise against the US dollar, as bitcoin enthusiasts and gold bugs converge. Nations like China, India and Russia continued to stockpile gold in their quest to diversify against the dollar last year. China’s Gold Bar Demand rose by more than 40%. The more gold these nations buy, the more the dollar could decline relative to their currencies, especially if they sell US treasuries, or reduce purchases, to buy gold. Even my old firm, Goldman Sachs noted the bitcoin boom hasn’t dampened gold demand. The economic power shift from West to East, and from the US dollar to the Chinese yuan, will continue for economic and geo-political reasons as China forges more solid global trade relationships and the US retains its nationalist stance. Given the Trump administration’s isolationist and pro-bilateral trade agreement doctrine, China will augment its economic, military and diplomatic presence globally. The Chinese government has invested billions in the BRICS Development Bank and Asian regional organizations like ASEAN. That type of long-term groundwork will expand in 2018. As it did in 2017, Japan embarked upon greater cooperation with India and Russia to hedge its US relationships. The Japanese economy also hit a growth streak in 2017. Its economy has been expanding since the start of 2016, the longest streak since 1999. Japan will keep developing its Eastern influence and seek new relationships as Prime Minister Abe consolidates his power. For the Bank of Japan, that means, despite some talk to the contrary, maintaining its aggressive QE program. The ongoing supply of cheap money will provide a bid to the Japanese stock market and massive liquidity to its banks. In 2015, Mario Draghi, the head of the ECB, decided to extend Euro-QE into March 2017. Then, he extended Euro-QE to December 2017, with a promise to do more if necessary. There was taper talk in the ECB’s QE program this year. In October, the ECB announced, that starting in January 2018, its asset purchases will follow a monthly pace of €30 billion until the end of September 2018, “or beyond, if necessary.” Ultimately, on an absolute value basis, the move was camouflage that will lead to more QE for Europe, not less. Over in the United Kingdom, having fallen 14% in 2016 due to Brexit anxiety, the Pound executed an impressive rise helped along the way by the BOE’s 25 basis rate hike. The Pound recorded its best annual performance against the dollar since 2009, with an almost 10 percent rise. Meanwhile, the Euro gained an impressive 14.1 percent vs. the dollar. Brexit is still looming. Yet, the Sterling has had a good run, and given the receding uncertainty over what Brexit could look like, this trend should extend in 2018. Once everyone realizes that UK banks aren’t moving to Frankfurt no matter what Brexit looks like, the Sterling will outperform the Euro. This will be positive for UK banks that have better capital cushions and are considered more stable. Currently, the US federal government spends about a modest $100 billion annually on infrastructure. States and cities have tapped out at $320 billion in allocated funding. How they could afford increases at more than double that rate is a mystery. Yet, the US remains at a huge infrastructure disadvantage relative to Asia and Europe. Any official talk of a bill combined with associated news coverage alone would lift bidding interest for government contracts, and share prices of companies in the sector. And we will hear more talk about a bi-partisan infrastructure bill and associated public-private partnerships in the wake of the Trump - GOP tax bill victory and into his second year in office. The problem is that his proposed spending of at least $200 billion over the next decade is contingent on $800 billion coming from state and local sources. Many states don’t have the budget to meet such infrastructure demands. This means other funding or increased federal spending will be hotly debated in 2018. Engineering and infrastructure companies will reap the benefits of related expectations and attention. As for Bitcoin, despite its predisposition to being a Ponzi scheme, it should rise (and sustain its high degree of volatility) through 2018 for a few reasons. First, many funds have been green lighted to get involved in the second half of 2018 and ETF’s are on the horizon, albeit with a plethora of surrounding problems and regulatory hesitations. Second, futures exchange activity will broaden the market. Third, establishment banks like Goldman Sachs have announced plans to set up crypto-trading desks and promoted the possibility of bitcoin becoming a legitimate global currency. There will be growth of the number and diversity of exchanges beyond Coinbase in the manner of PayPal which is already a player in that space, as well as for Coinbase itself. Expect the start of many payment exchanges that can process both regular currencies and cryptocurrency transactions ala the dot com bubble, rendering the idea of crypto-independence more and more fuzzy. Conversations amongst the financial elite at G7 gatherings and other similar forums will encapsulate more crypto focus. Central banks will ultimately create or utilize some elements of crypto currencies for themselves, and adopt ways to regulate the market, as will regulatory agencies that will focus more on crypto than regular banking activities (both need that monitoring to protect people.) Meanwhile, there will be more buying of cheaper crypto currencies (or assets as I consider them) like Litecoin and Ripple. The fight between those that believe in crypto’s decentralized nature will hit a wall of resistance from banks and central banks, but that fight might take years. Whether you use it, invest in it, or are wary of it – one thing is certain, mining crypto currencies require substantial amounts of power. While Bitcoin’s value was up seven-fold in 2017, its power requirements shot up by 43% just since October. Much of this power comes from generators fed by fossil fuel sources. That’s not clean power. Green technology for uses in blockchain related products will be a hot area in 2018, as will be clean and renewable sources of energy in general. Solar energy costs have fallen 62% since 2009 and could be cheaper than coal in less than a decade. As traditional fossil fuel economies from Saudi Arabia to Mexico begin to shift, green competition could drive down these costs further in 2018 and render clean energy more profitable. Beyond the crypto space, green jobs will boom, in some countries more than in others. China continues its efforts at a record pace has pledged to spend up to $1 trillion on infrastructure projects in 64 countries with which it seeks to strengthen alliances. Much of that will go into sustainable energy investments. China leads the world in investment in renewable energy projects with an estimated $32 billion spent overseas. Sustainable energy means jobs elsewhere, too. In 2018, Tesla plans to open the biggest battery factory in the world in Nevada. The UK government has announced massive £246 million investment in the automotive electrification research and development sector. The Securities and Exchange Commission (SEC), the regulatory agency tasked with protecting investors, shareholders and citizens from fraudulent financial system activities, is currently run by a man that served as Goldman Sachs’ outside counsel during its subprime crisis related spate of settlements. Goldman Sachs requested of him, that it be released from annual reporting of its lobbying policies or payments. He’s not alone in those sorts of allegiances. The Office of the Comptroller of the Currency (OCC) is run by a former colleague of Treasury Secretary Steven Mnuchin, Joseph Otting, who was the CEO of OneWest (the formerly failed California-based bank, IndyMac). That’s the bank that Mnuchin and his billionaire friends took over before exacting alleged tens of thousands of foreclosures and turning it around for a hefty profit. Then there’s the Fed, where Jerome Powell has expressed his disinterest in bank regulations over the years. The Consumer Financial Protection Bureau is now run by Mick Mulvaney - a man that has derided the very existence of the agency. Ultimately, the mother of all deregulators is presiding over the US Treasury Department. Steven Mnuchin has deflected the notion of reinstatement of a modern Glass-Stegall at every possible moment. He waived away regulation for AIG, the reckless insurance company at the epicenter of the financial crisis, by giving the firm a green light to stop reporting risk details to the Financial Stability Oversight Council over which he presides. Trump speaks of deregulation with pride. Nearly every regulatory body in his purview tasked with monitoring the financial system is run by someone who has benefited from its unfair practices or somehow believes too much regulation over bailed out big banks is a bad thing. Historically, severe crises follow periods of lax oversight and loose bank regulations. The question isn’t “if” there’s one budding, but “when” it will happen. The last time deregulation and protectionist businessmen filled the US presidential cabinet was in the 1920s. That led to the Crash of 1929, the Great Depression, and ultimately, brought us to World War II as I explained in All the Presidents’ Bankers. Whoever we are and wherever we live, may we face the challenges of this year, and our times, with awareness, courage and action. President Trump has talked a lot about America First. Over the last 6 months, we have seen that America First means that the United States could also be excluded from the rest of the world’s trade policy. For instance, Japan and the European Commission (EC) have recently agreed to an economic partnership agreement (EPA), which could be the largest trade agreement ever. This is an example of the United States being excluded from trade alliances. The new climate in the United States has created opportunities for other countries like Japan. The shift toward America First and isolationism is not wholly because of President Trump. It is the result of a trend that started approximately 10 years ago. It has much to do with the lack of regulation in the US banking system. Prior to 1999, the United States regulated banks under the Glass-Steagall Act. This Act required that banks separate their commercial banking operations from their trading, speculation, and securities businesses. That act was repealed in 1999, and the repeal has had a number of consequences. For one thing, the repeal led to a series of corporate scandals in the United States just a few years later. It also led to the creation of the “Too Big to Fail” concept. It allowed Citigroup, JPMorgan Chase, and Bank of America to become conglomerate banks. It led each bank to increase the risks they hold, and it increased the interdependency of banks throughout the world. That increased risk and interdependency eventually resulted in the global financial crisis. And yet banks still hold many of the same risky investments they had prior to the crisis, and are still interdependent. Many in the United States have been talking about reintroducing the Glass-Steagall Act in order to mitigate that risk and interdependency. When President Trump ran for office, he discussed this. It was in the Republican platform as well. However, since the election, two interesting things have happened. President Trump gave an interview in which he said he still needed to think about Glass-Steagall. Since then, he has not talked much about it. Meanwhile, Secretary of the Treasury Steven Mnuchin has said that President Trump does not intend to bring back the old Glass-Steagall Act, but is rather considering a “21st century Glass-Steagall” that would merely require banks to set aside money for emergencies related to risky investments rather than actually restructure. I would like to talk more in detail about some of the risks that banks now face in order to highlight why the discussion about regulations like Glass-Steagall is so important. One emerging risk today is corporate defaults. Thanks to quantitative easing, there is a lot of cheap money available in the market right now. According to S&P Global Ratings, as a result of all the cheap money, corporate debt is expected to climb from $51 trillion today to $75 trillion by 2020. At the same time, the global speculative-grade default rate is now 4.2 percent. This is the highest level since 2009, which was the worst year of the financial crisis. A total of 162 companies defaulted in 2016. This is the second time we have seen annual defaults above 100 since 2009. This has a large impact. When companies default, jobs suffer, research and development suffers, and the market suffers. It reduces confidence, which can catalyze a crisis. Even with the level of risk we are seeing around corporate defaults today, central banks continue to buy assets, to the tune of $200 billion per month. Will this pace slow in the future? Many are now talking about whether the central banks will change their policies on quantitative easing. The Federal Reserve has been slowly raising interest rates. On the other hand, the Bank of Japan has announced that it will begin an ‘unlimited’ Japanese Government bond buying program. One issue surrounding quantitative easing is that it is honestly very difficult to tell what the true effect of this policy is. There is no guarantee that when a central bank purchases bonds that it will result in more long-term hires or higher wages, for example. We cannot look at inflation or deflation to see how quantitative easing has impacted the market, because the money from quantitative easing doesn’t go to consumers. It goes to banks and financial speculators. We cannot be certain that any of the money has gone toward jobs or infrastructure. No regulatory requirement even attempted to guarantee that. This remark echoes a similar comment made by former Fed Chair Ben Bernanke in 2007 just before the financial crisis. Partly because of that, it is really difficult to accept what she is saying. For instance, the Federal Reserve subjected a number of banks to stress tests this year, and 34 banks passed. However, those tests don’t look at massive corporate defaults. They don’t look at interdependency. There are risks they don’t consider. The risks faced by banks in the United States today are greater than even before the financial crisis. The amount of assets that the big six banks hold is about 70% to 80% larger than it was prior to 2008. The amount of deposits they hold is about 40% higher. For these reasons, I think we need to be really careful about the rate at which defaults are increasing, how stocks are supported by share buybacks, and other risks fed by artificial, or conjured money. Central banks around the world are now pursuing a coordinated zero percent money policy and increasing their assets. The big three central banks in the United States, Europe and Japan now hold assets equivalent to about 17% of global GDP. If this money was liquidated into the real economy instead, it would have a huge positive impact. In recent years, central banks have used quantitative easing to inject more liquidity ostensibly into the economy. However, as I mentioned, that liquidity hasn’t necessarily reached the real economy. Quantitative easing has failed to produce real sustainable growth. There have been very low increases in wages throughout the world. For many people, even though their country’s economy may be considered stable by generic measures mostly touted by central banks and governments, their personal economies are instable. One outcome of that is that people are starting to question the ability of their governments to understand the economy. When that happens, people tend to vote out whoever is in power. This is one of the things that I think contributed to Trump’s victory in the United States. In turn, the economic situation globally has affected political decisions domestically, and those decisions are affecting our international alliances. The shift in our policies toward international alliances might again have an impact on the global economy. It’s a circle. President Trump seems to be shying away from multilateral agreements and toward more isolationist ideas. The last time the United States did that was in the 1920s. In fact, isolationist policies were one of the reasons there was such a speculative mood in the United States in the 1920s, and that speculation led to the financial crash of 1929. It looks like, for the time being, the United States will continue to act in a more isolationist manner. That is good and bad. It is bad from the standpoint of general global connectedness. It is good for other countries, including Japan. It gives other countries the opportunity to take on a stronger role in the international community. Japan is already moving to do that, as we can see with the Japan-EU EPA. Ever since President Trump came into office, alliances excluding the United States have been completed much more rapidly. These alliances were already being planned and executed before he came into office, mostly since the financial crisis to be sure and apprehension about the current dollar-based monetary system, but he seems to have accelerated them. This is happening all over the world. China is getting involved in more alliances. Japan is as well. I was in Mexico a couple of weeks ago and I spoke with people there about the North American Free Trade Agreement (NAFTA) and trade alliances. Since President Trump has come into power, he has been talking about how to get Mexico to pay for the wall he wants to build between the United States and Mexico. He has also made a number of negative comments about Mexico and about NAFTA. Furthermore, President Trump has also pulled out of the Trans-Pacific Partnership (TPP). Prime Minister Abe seems to be trying to save the TPP. He will not be able to move forward with the United States, but with all that has happened, we now have countries like Mexico that are looking at the situation with the United States and actively wanting the TPP to continue without the United States. Japan could thus, take a larger leadership role regarding the TPP..
With President Trump continuing to push his wall idea, US-Mexico relations are deteriorating. This presents a very good opportunity for China to develop its alliance with Mexico. When I spoke in Mexico, a trade delegation from China was there at the same time. These sorts of things are already happening more frequently. There has been movement on the part of other countries to create alliances outside of the partnerships with the United States ever since the financial crisis. With the election of President Trump, these movements are only accelerating. The Japan-EU EPA is a major agreement that has impacted that movement. Japan is a part of the shift that we are seeing as power in the international community moves slightly away from the United States. To a large extent, Japan can greatly influence how this shift plays out. Japan is already also involved in a number of other large trade deals, such as the TPP or the Regional Comprehensive Economic Partnership (RCEP). These deals could create a large amount of trade, and Japan is playing a leadership role in their negotiations. These deals are being worked out in opposition to US policies. Unless US policies change soon, they will move forward. And as the rest of the world moves forward with its own deals, the situation in the United States today is one in which the financial crisis and the concept of “Too Big to Fail” has led many to question whether we don’t need more regulation in the banking sector to avoid another crisis. However, many of the senior people in the Trump administration seem to be not very interested in bringing back something like the Glass-Steagall Act, so not enough is happening. There is action taking place around military spending. Although the new budget hasn’t passed yet, the draft does include a large boost for the military. We have a lot of people now working in Congress to figure out how the new budget will work, whether they can cut corporate taxes, or cut social spending, and so on. The latest draft budget will increase defense spending by approximately $53 billion. It earmarks an extra $2.8 billion for spending on homeland security. To make that budget balanced, President Trump is cutting from social insurance programs and institutions related to international alliances. President Trump’s isolationist tendencies are not supported just by the things he says; if the budget is passed, that isolationism will be carried out through budget cuts. Meanwhile, he is doing no meaningful work on his campaign promise to bring back the Glass-Steagall Act. In fact, there is movement in his ranks toward further deregulation. A recent bill passed in the House of Representatives, dubbed “The Financial Choice Act” called for the loosening of banking regulations. If this new legislation is passed, it will likely just require that banks hold onto more money for emergencies, in reserves, rather than actually separate deposits and lending activities from speculative ones. I think the lesson here is that there is a lot of inconsistency in what President Trump has said and what his administration is doing, and I think that people around the world understand this and that it is catalyzing the shifts in power and new economic alliances that we are seeing globally. The Trump presidency is accelerating the movement of world currencies away from the United States dollar. Alongside all of that is the problem of whether or not the markets are sustainable at their current levels. They are not. There is a lot of risk in markets and in the economy right now. There exists a large disconnect between how the financial sector feels about the economy and how normal people outside of the financial sector feel about it. There remains a disconnect between how politicians view the economy and markets and the banking and monetary system and how it's viewed by populations on the ground. This dichotomy fueled by ongoing money conjuring policies can't end well, it can only result in another crisis. The question isn't if, but when.